Identification: Quite variable. 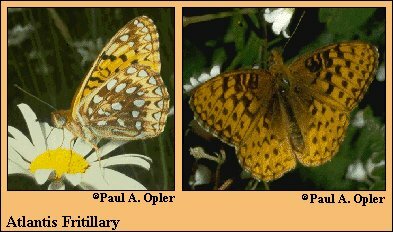 Upperside orange-brown, darker at base, with black outer margins; male has black scales on veins. Underside of hindwing with basal disk chocolate brown or purplish, hindwing spots always silvered. Life history: Males patrol during the day in forested areas or along streams. Eggs are laid singly on leaf litter near host plant. Unfed first-stage caterpillars overwinter, emerging in spring to feed on leaves. Adult food: Flower nectar including that from common milkweed, mints, mountain laurel, crown vetch, burdock, boneset, ox-eye daisy, spiraea, and virgin's bower. Habitat: Forest openings, upland pastures, bogs, meadows, and moist canyons. Range: Maritime Provinces and northeast United States south to West Virginia, west through the Great Lakes region and southern Canada. South in Rocky Mountains to Colorado Front Range.